Movies are getting expensive lately. 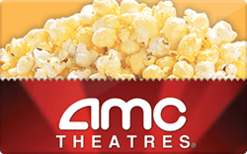 Buy a discounted gift card to save at AMC Movie Theatres. Giftcards work like cash and can be used on newly released movie passes or matinee ticket prices, or to even pay for the upgrade for IMAX/3D. It's just like cash so it makes sense to buy it and save.